This is a traditional Egyptian Stuffed Grape Leaves recipe shared with What’s Cooking America by Chef Maha Barsoom. Maha is a personal chef and caterer specializing in Egyptian cooking. Maha travels all over North America and Europe teaching about Egyptian cooking and cuisine. Maha says, “Egyptian stuffed grape leaves are not hard to make – but they take forever to roll, and they are eaten in no time! This is why they are generally served for special occasions such as Christmas, Easter, or for special guests. They do not even take that long to cook, but the rolling is the issue. If you have a big family, then this will help as everyone can join in and the pot is filled in no time. My mother used to make them for us all the time. She would make them soft and juicy and she would roll for hours to make a huge pot full for all of us. Then we all sit together and enjoy eating the whole pot in less than an hour! She would flip them on the serving dish and then squeeze lime juice on top – the smell and the taste is out of this world! My mom made them for us vegan or with lamb meat… So yummy! It is a big tradition in our family to have vegan stuffed grape leaves on Good Friday with falafel and sprouted beans soup. My mom cooked the best Good Friday dinner. We would come home from church looking forward to dinner after fasting the whole day. More delicious recipes using grape leaves: Stuffed Grape Leaves with Gorgonzola and Olives. * Can use fresh or jarred grape leaves. See below instructions. *** Do not use extra virgin olive oil - must use regular olive oil or the rice will be too sticky and heavy. **** Egyptian Spice Mix a spice blend that goes well with poultry, vegetable, and rice dishes. This spice can be found at gourmet or Middle Eastern grocery stores or online. ***** Learn how easy it is to make homemade Chicken Stock - Basic Chicken Stock. Line the bottom of a heavy pot with fresh sliced tomatoes and sprinkle them with sliced garlic and set aside. Using fresh grape leaves: Grape leaves are best picked from grape vines in the Spring, while they are still tender. Select young whole, medium leaves. NOTE: Be sure and pick them before the first spray as some sprays are toxic. Most of the sprays used today are non-toxic and water soluble, but sulfur taste is not what you want on your grapes. Pick approximately 1 1/2 pounds of fresh leaves which are the same as one jar of preserved leaves. Using scissors, cut off the stems and either soak in very hot water for 15 minutes to soften or blanch grape leaves until they are soft (the time will depend on the leaves - fresh ones will only take a minute). They can be washed and stacked on top of each other and frozen in resealable plastic bag. heck out my article on Using Fresh Grape Leaves. 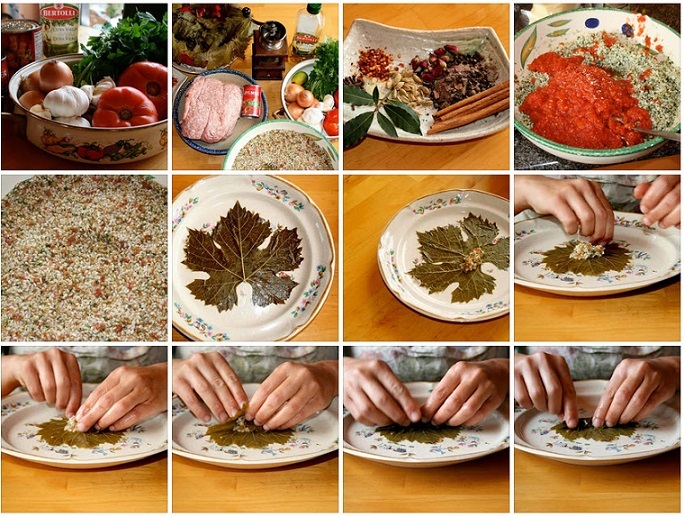 Using jarred Grape Leaves: To prepare jarred grape leaves, rinse well under cold water to remove the brine. Place them in a colander (back side up) to drain and hold until ready to use. NOTE: Do not throw away any torn or damaged leaves, as they can be used to patch holes in other leaves. Preparing the Rice Mixture: Rinse uncooked rice thoroughly in cold water and drain in colander. In a large bowl, mix the uncooked rice with raw ground beef, grated onions, minced garlic, crushed tomatoes from the can, oil, parsley, spices, mint, salt, and pepper. Set aside to use for stuffing. Place a leaf with the stem towards you on a plate or flat surface. The veins of the leaf should face up. Using the point of a sharp paring knife cut out the stem of the leaf and set aside stems to reserve for later use. Overlap the bottom two sections of the leaf toward the center. Place a teaspoon of the prepared meat/rice filling on the bottom center of the leaf, just above the stem. Fold the bottom section up to cover the filling. Fold the sides in towards the center. Continue rolling the packet up towards the top point of the leaf. 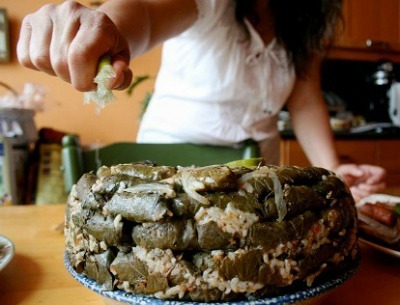 Place the prepared stuffed grape leaves in a circle then in layers in the pot, always with seam down. Sprinkle with the reserved stems of the leaves to give a tangy taste to the rice. Pour stock or water over the stuffed leaves enough to cover them by about an inch. If you use chicken stock, you do not need to add salt, pepper, and olive oil. If using water, add olive oil, salt, and pepper to water to taste. Place an inverted heatproof plate on top of the rolls to keep them submerged in the water. Cover the pot with the lid and bring just to a boil. Lower the heat and simmer over low heat for approximately 45 minutes to 1 hour or until the leaves are tender and the rice filling is cooked through. Remove from heat and let cool. Once the stuffed grape leaves have cooled, place the serving plate on top of the pot and flip the pot upside down to have all the stuffed leaves all intact and stacked on the serving plate. Squeeze the lime juice on top and enjoy! Serves many as an appetizer or 3 to 4 people as main course. Love your recipe. if it helps you can make the Egyptian spice yourself. Would you share the recipe for Egyptian spice please? I don’t know the ratio of measurements but the spice label says it contains the following ingredients: Mixed Pepper, Cloves, All spice, Ginger, Rosebuds, Cardamom, Cinnamon, Nutmeg. Wonderful recipe. Very authentic. Thanks!